Alcatel-Lucent and Qualcomm agreed to collaborate on small cell base stations for residential and enterprise environments. Specifically, the companies will jointly invest in a strategic R&D program to develop the next generation of Alcatel-Lucent lightRadio Small Cell products featuring Qualcomm Technologies’ FSM9900 family of Small Cell chipsets. The investment would be shared by Alcatel-Lucent and Qualcomm Technologies. "This initiative perfectly illustrates The Shift Plan we announced last month, which will see Alcatel-Lucent focus on growth technologies, including those facilitating ultra-broadband access. We also said we would actively seek collaboration with key industry players. 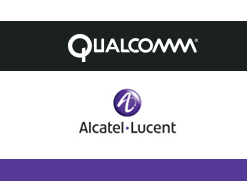 In working together with Qualcomm Technologies - a world leader in advanced wireless platform solutions such as its small cell chipsets - Alcatel-Lucent will continue to be positioned at the forefront of innovation in the small cells market," stated Michel Combes, CEO, Alcatel-Lucent. 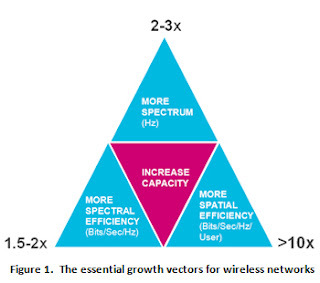 "Small cells greatly increase capacity by bringing the network closer to the user, thus enabling operators to serve the anticipated 1000x growth in mobile data traffic and dramatically improving the experience for wireless subscribers," said Dr. Paul E. Jacobs, chairman and CEO of Qualcomm Incorporated. “Working together with industry leaders like Alcatel-Lucent, we can accelerate the dense deployment of small cells globally, driving another significant leap in advanced wireless broadband technology and services." Riverbed is rolling out a series of enhancements for its Steelhead WAN optimization product family, including a new hardware appliance and new path selection capabilities that enable specific applications to be directed over selected WAN paths. 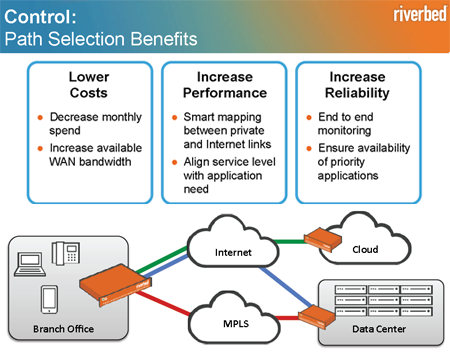 Significantly, the new release of the Riverbed Optimization System (RiOS 8.5) enables application-specific path selection for branch offices where both MPLS and Internet WAN services are available. Riverbed is integrating DPI in CascadeFlow with RiOS 8.5, thereby leveraging DPI capabilities within Cascade Profiler 10.0.7 to identify and characterize traffic flows across the network and among branch offices. Riverbed said this capability could be used for fine-tuning QoS, directing certain branch office traffic onto the corporate MPLS VPN while sending other application flows directly to alternate paths, or to a cloud service provider using an alternate Internet connection instead of through the MPLS VPN. The combination of path selection and application identification via deep packet inspection also ensures that application flows could be rerouted in the event of performance degradation on the primary route. The latest software release also adds new application optimizations for the Steelhead appliance, including for Microsoft SharePoint 2013, Exchange 2013, Office365 and file sharing applications that utilize the server message block 3 (SMB3) protocol in Windows 8 and Server 2012 environments, and NetApp SnapMirror for tiered SLAs. Riverbed cites significant performance gains for its WAN optimization -- up to 98% decrease in bandwidth utilization and improving application acceleration up to 100 times faster. Amazon Web Services has launched two points-of-presence edge facilities India. The new Amazon CloudFront POPs, which are located in Chennai and Mumbai, join a global network of 42 edge locations worldwide that Amazon uses to deliver content to end users with low latency and high data transfer speeds. The new edge locations also support Amazon Route 53, a highly available and scalable Domain Name System (DNS) web service. "Organizations in India need the flexibility to rapidly scale IT infrastructure as they grow without spending precious capital on hardware or getting locked into a long term contract with a co-location facility," said Shane Owenby, Amazon Web Services Managing Director of Asia Pacific. "Using AWS has removed the constraint related to infrastructure resources and has enabled many of our customers, ranging from start-ups to enterprises to unleash their ideas, innovate fast and build new businesses quickly. With 9 AWS Regions and 42 Amazon CloudFront edge locations around the world, our customers are able to expand globally virtually overnight while delivering great local user experience for their services." Audi announced its first car with embedded LTE capability. 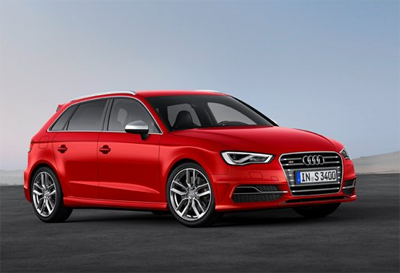 Starting this month, the Audi S3 Sportback may be ordered with integrated LTE. All other Audi model variants of the A3 premium compact car will be available with embedded LTE from early November. Audi says the advantage of LTE in automobiles is better communication between the car, the driver, the environment and the Internet. LTE enables the exchange of large amounts of data via the Internet, such as music and films in HD quality. Commercial LTE networks already exist in many European countries and in the USA. In Germany, LTE is available in a few large cities, but is primarily active in many rural areas. To use LTE, drivers will need to provide their own SIM card with a flat rate data plan. The SIM card is inserted in the Audi MMI navigation plus unit. The MMI navigation plus uses LTE to deliver the tailored services of Audi connect to the driver - from navigation with Google Earth and Google Street View to Audi music stream web radio and online traffic information. The Audi S3 Sportback is equipped with a Wi-Fi hotspot, enabling multiple passengers to surf the web independently. Audi is also making Facebook and Twitter vehicle-friendly with a text-to-speech function and a text function with prepared text modules. In addition, there are over a dozen Audi connect services, including a text-to-speech function for e-mail and a dictation function for text messages (SMS). And the range of services is expanding rapidly. Gigamon reported Q2 revenue of $32.4 million, compared to $22.5 million in the second quarter of fiscal 2012. GAAP net loss for the second quarter of fiscal 2013 was $7.9 million, or $0.41 per diluted share, compared to GAAP net income of $1.3 million, or $0.08 per diluted share, in the second quarter of fiscal 2012. "In our first quarter as a public company, we delivered solid revenue growth of 44% year-over-year," said Paul Hooper, CEO of Gigamon. "Our Visibility Fabric enables our customers to gain higher levels of visibility into their IT infrastructure by delivering the right network traffic to the right management system, at the right time. We believe our market is significantly underpenetrated, and through our broad, intelligent and scalable solution, we believe we are well-positioned to capitalize on this exciting growth opportunity." PMC-Sierra reported Q2 revenue of $127.9 million, an increase of two percent compared to $125.2 million in the first quarter of 2013, and a decrease of seven percent compared to $137.8 million in the second quarter of 2012. GAAP net loss in the second quarter of 2013 totaled $4.2 million, or $0.02 per share, compared to a GAAP net loss in the first quarter of 2013 of $6.8 million, or $0.03 per share. Non-GAAP net income totaled $16.3 million, or $0.08 per diluted share, up 22 percent in the second quarter of 2013 compared to non-GAAP net income of $13.4 million, or $0.07 per diluted share in the first quarter of 2013. "Our second quarter results were in line with our outlook despite the muted environment," said Greg Lang, PMC president and chief executive officer. "The recent acquisition of IDT’s PCI Express (PCIe) flash controller business further expands our growth opportunities and positions us as a leader in the rapidly growing enterprise solid-state drive (SSD) market segment." Extreme Networks announced the appointment of Edward (Ed) T. Carney as executive vice president of product and customer success. Carney previously served in general management at Cisco in Research Triangle Park (RTP) where he spent 15 years, and prior to that with IBM. Carney will be based at Extreme Networks facility in the RTP, in Morrisville, NC.